HEL-LO Let's Talk: HEL/LO 3 VIDEO: "WE NEED TO START THINKING IN A NEW WAY"
HEL/LO 3 VIDEO: "WE NEED TO START THINKING IN A NEW WAY"
HEL/LO – Let's Talk About Alternatives from The Finnish Institute in London on Vimeo. What does it mean to be alternative in design and architecture? Why are margins important? Do we need alternative methods of producing alternatives? HEL/LO – Let's Talk About Alternatives took place at the Pavilion in Helsinki 12 September, and focused on alternative ways in design and architecture. The speakers talked about their personal relationship to the theme, and shared their views on what constitutes alternativeness in their particular fields. The speakers at the third HEL/LO event included Alex Warnock-Smith, Annamari Vänskä, Krista Kosonen and Sean Griffiths. Get to know them better here. The talk was chaired by Beatrice Galilee. 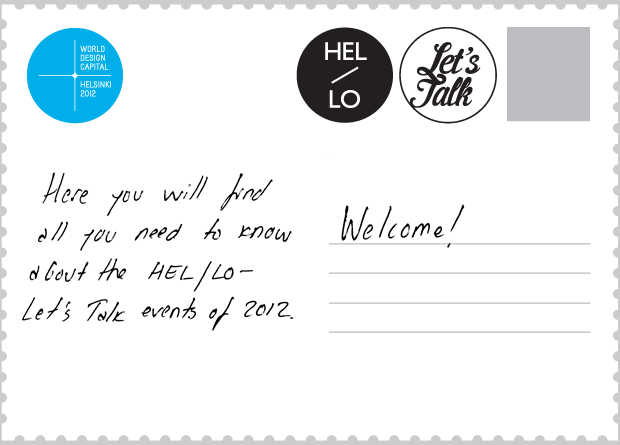 HEL/LO – Let’s Talk is a series of four design events taking place in London and Helsinki. It is organised by the Finnish Institute in London in collaboration with Blueprint magazine. HEL/LO is part of the World Design Capital Helsinki 2012 international programme. The HEL/LO discussion series has now ended with the last two events taking place earlier this September. HEL/LO – Let's Talk is created by Hanna Harris (The Finnish Institute in London) and Owen Pritchard. Visual concept and set design by Emmi Salonen (Studio EMMI) and Chrissie MacDonald (Peepshow Collective). Read more about the Finnish Institute's previous design projects here.